Do you ever wonder just what are the 10 Commandments? If you live in the United States of America, you have likely heard of them often. They come from the Christian religious traditions that dominate that nation, and there are sometimes political controversies about them being posted in courtrooms or other government spaces without compensation. In the Christian mythology, the 10 Commandments originate in the first half of the Bible, also known as the Old Testament. As Moses led his tribes out of Egyptian slavery and towards the Promised Land, they spent some time in the desert, wandering around in the wilderness. The story has it that he went to the top of a mountain and spoke to God, who had assumed the form of a burning bush that would not actually extinguish. The 10 Commandments were brought down to the valley by Moses as the word of God as ethical and moral guidelines. 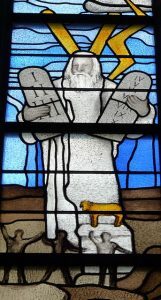 Several of the commandments establish God’s domain over his followers, saying that they should not worship any other gods before him, nor take his name in vain or make any ‘graven images.’ Another commandment establishes the Sabbath as a holy day of worship and rest; different denominations and faiths have this built into their lifestyles, some on Saturdays and some on Sundays. Additional commandments declare expectations of respecting parents and elders, as well as commitments to not stealing, lying, committing adultery or killing. Another group of commandments urges avoiding the coveting of of a neighbor’s wife, house, possessions, house, servants, or animals. While many know the 10 Commandments as a relatively Christian concept, the Catholic and Protestant traditions can not solely claim these ideas as their own. The story of Moses as a prophet and his teachings were also influential in the development of Judaism and later on the various sects of Islam. All three religions share a common historical background.